Learn how to smoke food - cheese, fish, meat and more! Buy as Christmas presents - or for yourself! I am sorry to say we will not be running our courses in the forseeable future. We are looking at developing alternative ways of sharing our smoking experience through bespoke demonstrations and special events; in the meantime our book and smokers are available as are we if you have any questions as are on Facebook and Twitter - and even on the end of a phone! We ran an award-winning artisan smokehouse until 2004 and have been sharing and teaching the art of food smoking since 2006 to foodies - complete novices and professional chefs, entrepreneurs and even viewers of BBC's One Show and ITV's Good Morning. Although we are not running courses the second edition of our book (and some of the smokers we feature) are available through this site. The book is based on the course and is designed not only to take away the fear of smoking food for the novice but to excite and inspire those who already have experience with food and/or smoking. 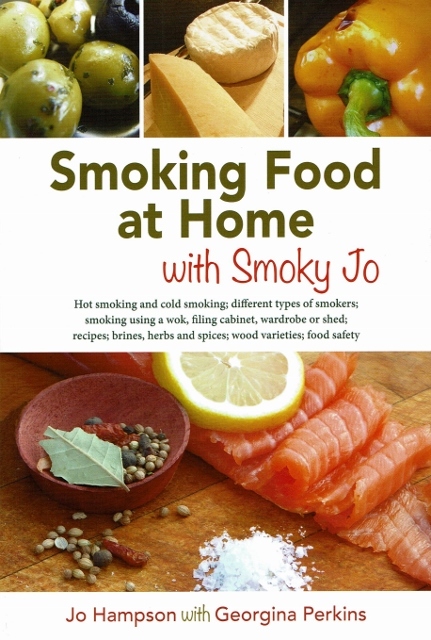 The latest edition of our book "Smoking Food at Home with Smoky Jo" is in stock! We have assembled our cold smoker and are really going for it today....butter, olives, cheese, nuts and salmon... "
" ... huge thanks for yesterday. I had a great time and your passion for smoking is really contagious. I thoroughly enjoyed the whole day and learned so much. My family have since tried the goodies I brought home and want me smoking at home ASAP." " We had a brilliant and marvelous fun and informative course this last weekend; wouldn't have changed a thing about it. People great, food amazing, accommodation unexpectedly delightful, so very glad we came. Congratulations on a top quality event in every possible way. For anyone who enjoys food whether or not they intend to smoke, just to absorb the facts and taste the tastes its a heavenly course. Make a weekend of it or incorporate it in a holiday break. So good to meet you Jo and Georgina. 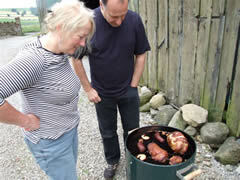 ITS A MUST DO course..... "
Did you see Smoky Jo in the smokehouse near Windermere on ITV's The Great British Taste Tour? 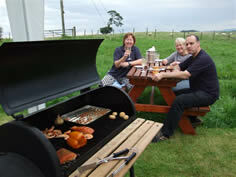 9 best weekend courses in Europe includes Smoky Jo's Food Smoking Courses!
" 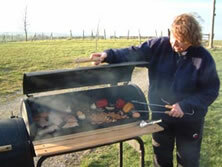 I just wanted to let you both know what a thoroughly enjoyable day I had with you this week on my Smoking course. You both made it so much fun and best of all the food was FANTASTIC." See the review of our food smoking courses in Stella Sunday Telegraph Magazine, Sunday 10th October! - but actually it is a great day out for anyone! Smoky Jo, Smoky Georgina and Freddy the Filing Cabinet smoker! Smoky Jo's on BBC The One Show?